Dragon's Pearl slot is pretty basic, incorporating only one feature as is mostly the case with Novomatic games, especially the html5 games. 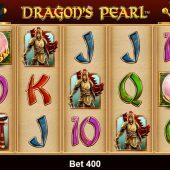 The theme is Eastern as you may have guessed with any slot that has 'Dragon' in the title and the symbols accordingly have an Oriental appearance right down to the A, K and Q face card symbols. The best-paying symbol is the green Dragon at 80x stake for 5-of-a-kind on this 20-line slot. You have the standard 3 rows and 5 reels with a Golden Egg Wild which doesn't multiply but actually substitutes for the Pearl scatters, but these aren't the feature-triggering ones, simply pays. You get 25x stake for 5 Pearls, but should a Wild be included you will find this doubles or triples the award. The symbols are all single, no stacks. Should you land 3 'Bonus' scatters on reels 1, 2 and 3 you will find yourself the recipient of 10 free spins with all pays tripled. As with many Novomatic games you tend to find the reels more beneficial in the free spins, and these can be retriggered. That's pretty much it!